Yeah, yeah, we get it: wheelie bins are one of those unfortunate facts of life. They're not especially attractive, and they can get pretty stinky too, but you've got no choice but to have them on your property. But if you want better bins, we're here to help you out. We can't promise to eliminate unsightly bins and disgusting smells completely, but we can help you make your bins better. Don't believe us? Then read on! 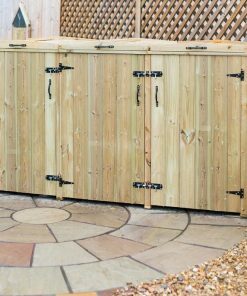 Our first step here is to get your bins properly cleaned, since that will get rid of a lot of the smells that have been hanging around, as well as lessen your chances of mould, fungus and bacteria growing. You need a suitable place to clean your bin, which should be outside, but on your property (environmental laws prohibit cleaning of bins on pavements etc.). Close to a drain is a good plan too, so that nasty water can go into the sewage system. First up, the outside. Grab yourself a disposable scrubber, some environmentally safe cleaning products (yes, this is important, since your garden is likely to absorb some of the product), and a water source (ideally a hosepipe). Give the outside of your bin a good scrub down and rinse off. What about the inside? Easy. Mix up a bucket of hot water and your environmentally safe cleaner, pour it in the bin, and get your mop. Use the combo of soapy water and mop to thoroughly clean the inside of your bin. When it comes to emptying that water, you can tip it directly down the drain (if you can), or empty it back into the bucket and dispose of it in the toilet. Rinse well with your hose, and you should be sparkling clean. Now, the most important part: Leave your bin OPEN until it is completely dry inside (many moulds, fungi and bacteria thrive in damp conditions). Once you're dry, you're good to go. All of that cleaning sound like a whole lot of hard work that you'd rather not do? You can avoid having to clean your bin too often by using appropriate bin liners. Choose your bin liners carefully, opting for thick material (a little pricier, but worth it if you don't fancy bags splitting and spilling rubbish). Getting bags with included plastic or elastic ties is a good plan too, since these are more likely to stay sealed. On top of the bin liner issue (which hopefully you've already dealt with), we do have a pro tip for you. It's worthwhile investing in a pack of large industrial bin bags. Simply take one of these and put it (empty) into the wheelie bin itself, clipping the edges down if necessary to keep it stable. That way, your wheelie bin is double protected. Chances are that your bin men will empty the whole bin (including that extra liner), so make sure that you replace the industrial bag after your bins have been emptied. You can also buy special wheelie bin liners, many of which are biodegradable. These do tend to be a little pricey though, and given the chances of your bin men trashing the liner as well as your rubbish, you're probably better off with the industrial rubbish bags we recommended. Hopefully your bins are now smelling sweet (well, as sweet as bins can smell), but we still haven't dealt with the attractiveness issue. Fortunately, there are many solutions on the market right now to disguise your bins. The cheapest option is some kind of sticker or transfer that you stick onto your bin. These are usually decorated with pretty patterns, and whilst your bin still looks like a bin, at least it's a prettier bin. A more effective solution is to opt for some kind of bin store or cover. These come in many varieties, ranging from a wicker screen to sturdier wooden boxes like our Bellus, Arbor and Hortum ranges. Either way, your bins will be completely hidden from sight. 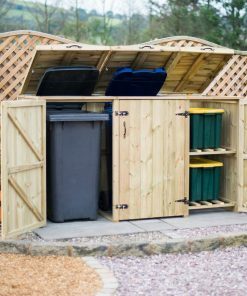 If your property is large enough to put up one of these bin stores you'll never have to look at your bins again. Whether or not you decide to hide your bins away, there's yet another attractiveness issue. Overfull bins, with their gaping lids and spilling rubbish, are far from good looking. More than that, in some places bin men won't collect wheelie bins that don't close! So how can we solve the problem of overfull, ugly bins? One solution here is to buy a bin compactor. These devices usually clip to the edge of a bin. When you add rubbish, you swing the compactor over and let it squash down what you've added, meaning you can fit more trash into your bin. Yes, you'll need to spend a bit of cash on one of these circa £20, but it might be worth it. Alternatively, you can compact rubbish yourself, at least as much as you're able, by ensuring that packaging is deconstructed, jumping on bulky items to flatten them out, and so on. If overfull bins are a frequent problem for you, you might want to get in touch with your local council and see if they add an additional wheelie bin to add to your collection! Just because you have to have wheelie bins on your property doesn't mean that your garden or driveway has to look or smell bad. Taking a little time to properly clean your bins occasionally, being careful what you throw away, and maybe even investing in a bin store, are all ways of ensuring that your property still looks and smells great. Wheelie bins might be a fact of life, but ugliness and smells don't have to be!